Kemco International, Inc. (dba Kemco Group) will be introducing new product lines, as well as established brands that it has carried for years, to Interbike this year. According to Kemco's Tom Curran, the move is in response to strategic partnerships and increasing demand in specific market segments. Kemco International will be displaying at #3201at the Sands Expo Center in Las Vegas, September 24-26. "This is a very exciting year for us," said Curran. "We're coming to Interbike with new products, and we've made some important additions to some of our existing lines that will get everybody's attention." Joining Kemco is Hyper BMX, which includes frames and BMX racing components. "Hyper is not only one of the best-known names in BMX, but it now has an Olympic medal to its name, thanks to Donny Robinson's outstanding third-place finish at the Summer Games in Beijing," commented Curran. "Kemco is proud to be Hyper's exclusive worldwide marketing representative, and we have products that are at the front of the pack in terms of performance, design and profit." 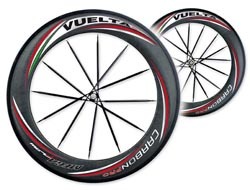 Curran says the company's Vuelta wheel line will be expanded for 2009 with two brand-new carbon models - a high-performance full monocoque 50mm clincher at $1,500.00 retail, and a tubular wheel for retail under $1,000.00. "We are very proud of these two new wheelsets, because of their combination of highly desirable features, performance and price points," said Curran. Two more additions to the Vuelta line include the Corsa HD for the popular Clydesdale segment with a maximum rider weight of 250 pounds and a $250.00 retail price, and the entry-level Track Pro that will retail under $200.00 for the ultra-popular fixed-gear market. A complete line of competitively-priced Vuelta replacement cranks for Road, Mountain, Track and Tandem will also be on display at the show. The complete selection of Vuelta cranks will be on display at the Kemco International booth to give visitors the opportunity to see the level of product quality and value first-hand. Another new brand being handled by Kemco is the No Contest P&A line from China. Available directly from Shanghai, the brand consists of a variety of value-based items, including water bottles and cages, locks, pumps, tools and soft goods. "We have also added 9- and 10-speed chains, plus connecting links, to complete our Vuelta chain line," said Curran, who notes that Kemco will also display the core products that have made the Pacoima-based firm the "go-to company" for many distributors and manufacturers in the bicycle industry.